Here, a picture from Bankilaré, Tillaberi: a village forum where the subject is the cooperation between the population and the FDS (Defense and Security Forces) in the fight against insecurity. International Media Support (IMS) is a non-profit organisation working with media in countries affected by armed conflict, human insecurity or political transition. We work for free and professional media. IMS is running a four-year Sahel Programme in strategic partnership with Danida. The program intervenes in Niger, Burkina Faso and Mali and it is implemented between 2018-2021. The overall objective of IMS Sahel programme and thus also in Niger, is that civil society & media widen space for freedom of expression and produce and distribute public-interest media content that promotes accountability, counters radicalization, and fosters inclusion. 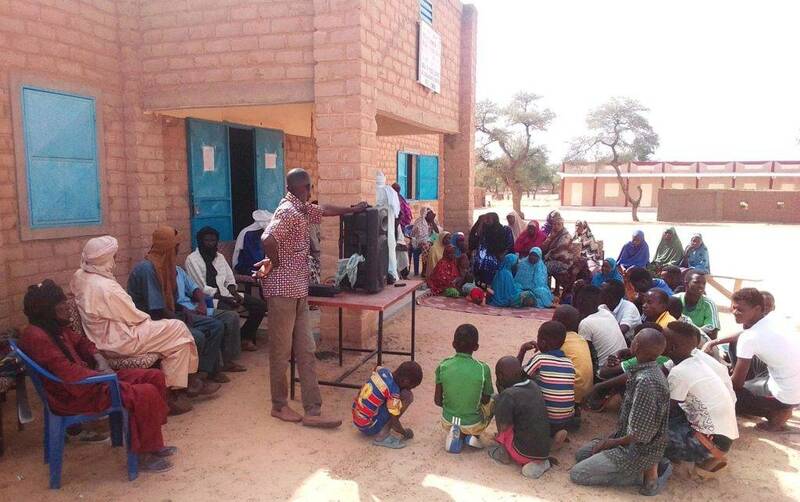 In Niger IMS works closely with Coordination Nationale des Radios Communautaires (CN-RACOM), local community radios and women’s listening clubs in the Tillaberi region, and with radios and clubs from North Eastern Burkina and Northern Mali. The goal is to strengthen CSOs and radios in the fragile border areas, where local radios and women’s clubs produce and disseminate high-quality content aiming to catalyse discussion among citizens, leaders and authorities on resilience, social cohesion, migration issues and peace-building. Furthermore, IMS works with professionalisation of journalists in Niger. To train the journalist and support their content IMS collaborates with CENOZO which intervenes in Niger but has its head-office in Ouagadougou. A third target of IMS is the creation of a regional network of local, regional and international partners working for or with the media and development in the Sahel. A row of organisations are active in this network. IMS has a small office in Niamey, and the local contact person is Djibril Saidou ds@mediasupport.org IMS Sahel Programme Coordinator. IMS contact person for the Sahel programme in general is Jane Møller Larsen jml@mediasupport.org, IMS Programme Manager for Sahel & Sub-regional Head for Francophone West Africa.